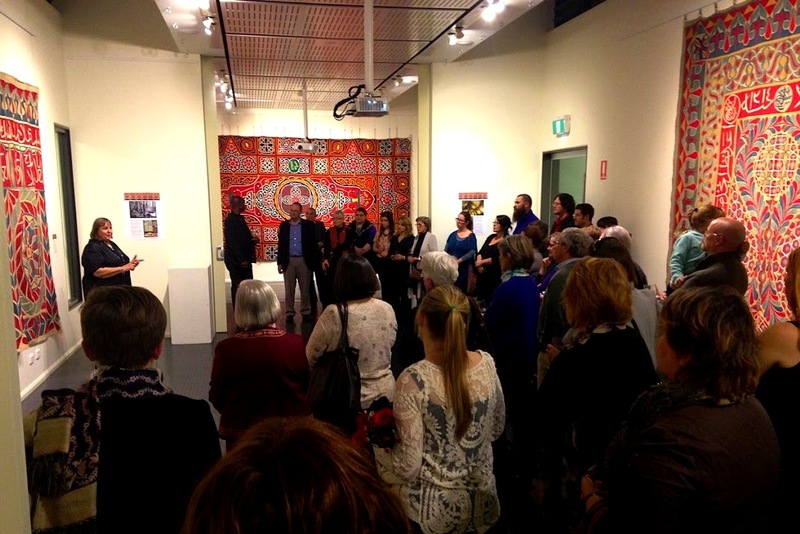 This powerpoint file contains a 10-minute recording of Jenny Bowker’s speech at the Opening to “Khayamiya: Khedival to Contemporary” in Wagga Wagga, as well as a few of my own acknowledgements to the talented individuals who have generously supported the exhibition and my research. Jenny speaks about how she became involved with the Tentmakers of Cairo, the way she brought their contemporary work to international attention, and what the unveiling of historic Khayamiya means for her. Many thanks to Michael Agzarian for your photograph of the Opening, which captures the spirit of the evening. These textile works of art have to be seen to be believed! Absolutely awesome, all hand appliqued work….. I came away from the Canberra exhibition absolutely breathless. Make a date with fellow textile enthusiastic and enjoy! !